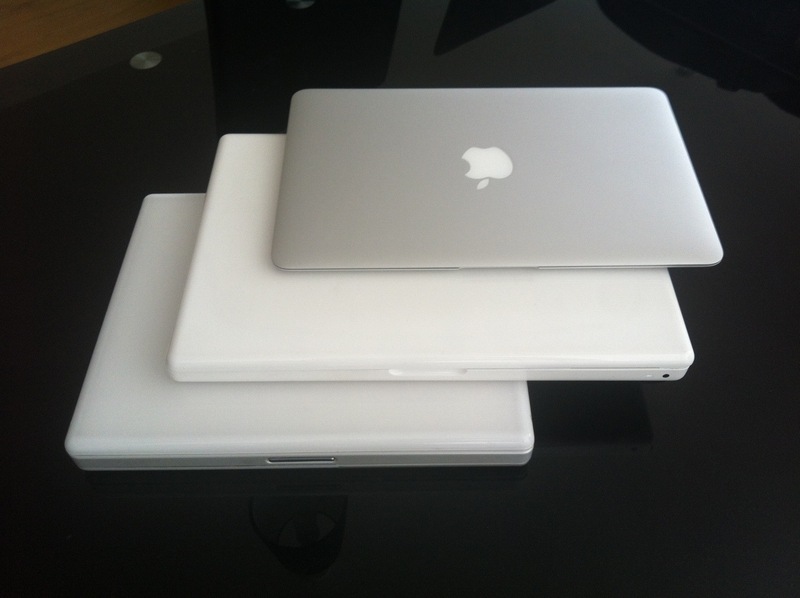 A laptop sandwich: From bottom left, iBook, MacBook, MacBook Air. The one major drawback of the 145 was one that plagued most laptops of the time and would continue to do so for years: reliability. It didn’t last me more than a few years before it broke down to the point where repairing cost as much as replacement. Since I didn’t have the coin to do either, I passed out of the realm of Mac laptop-dom for several years, reverting to a desktop iMac when I finally got a job and could afford a machine of my own. When I finally got my hands on a Mac laptop again, about ten years ago, it was in the form of a 12-inch white iBook. (The bottom layer of the laptop sandwich above.) With a PowerPC G3 CPU, an unheard of 128MB of RAM and a combo CD/DVD drive, it was a major step up in every way. The 12-inch form factor made it all the more appealing, as it was far easier to carry than the by-then lost in the mists of time 145. It was a lot more robust too, and it suffered its fair share of battering as it accompanied me for several years. However, it had one fatal flaw: a logic board issue that broke the connection between the computer and its screen. As before, the cost of repair rose too high, and the iBook was banished to a cupboard as I returned to the world of the desktop. Five years ago, I took another shot at the Mac laptop scene, this time in the form of a 13-inch polycarbonate MacBook. (The middle machine above.) Like the iBook, it was white and plastic, but it raised the solidity factor a few notches, and despite the fact that it had a larger, 13-inch screen, it felt sleeker and lighter to carry. Despite the plastic shell’s tendency to fray at the edges (and the fact that the first iteration of this laptop was stolen by an absconding flatmate when only a couple of months old), it was by a long distance the most robust laptop I’d ever used. In five years, the only problems it suffered were a few hard drive glitches that eventually ironed themselves out. However, five years is a long time in computing, and the MacBook has been struggling with newer software for a while. So the time came last month to put it out to pasture and move on. Where to? To a MacBook Air, leaving behind the world of polycarbonate in favour of an aluminium unibody. This leap shouldn’t be understated. The screen is a mere 11 inches yet bright and pin-sharp, and the laptop itself is so thin and light that the first time it was in my shoulder bag, I had to resist the urge to check whether it was there. For all that, it feels amazingly robust. For someone who is used to thinking of computers as circuit boards wrapped in a plastic shell, this feels like a solid lump of computing ability. Apple gets a lot of grief for making machines that users are never supposed to delve into or alter, but the tradeoff is clear: this has been engineered to within an inch of its life, and picking out a flaw is very hard to do. The leading edges are so thin that the thought of attaching the Air to an axe-haft and using it to split wood isn’t completely ridiculous. The sound that the lid makes when it closes is redolent of solidity in much the same way as the sound of a high-end car door closing. No doubt I’m still in the afterglow of an encounter with the new shiny. It’s happened before. There may yet be flaws that time will reveal. At the moment, all that occurs to me is the fact that my hands are a little large and come into contact with those sharp case edges when I type a little too often. A case may be needed, but for once it’ll be for my protection more than it will be for the machine’s. My kingdom for a laptop, but which one? 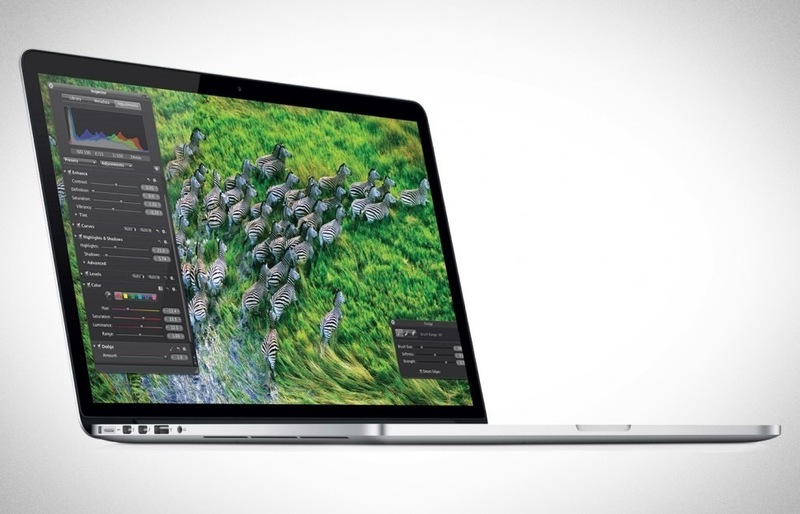 The Retina Laptop: shiny takes a quantum leap. So Apple revealed the long-awaited upgrades to their laptop line at their WWDC last week. As someone who’s been using their products for years, and for whom a new laptop is rapidly becoming more of a necessity than an option, I was keen to see what they might provide. And amidst all the glitz and sheen, I got plenty of information on what my next laptop might be, but also the one after that. I’ve had my eye on the MacBook Air ever since its first revision made it a compelling option rather than an overpriced status symbol. The 11-inch version is eminently portable, and all it seems to lack over its 13-inch brother are an SD-card slot, a slightly faster processor, and better battery life. All things that are desirable but not must-haves. The new MacBook Airs are faster than before, now come with USB 3.0 ports and improved video cameras and are just as sleek as ever. However, the MacBook Pros also got their due upgrades, also with faster processors. Shiny and sleek though they may be, they lack something in the portability department when compared with the MacBook Airs, but make up for it in terms of connectivity and storage. Hard drives are still streets ahead of solid-state storage in terms of capacity. The 15-inch Pro is out of my price range, but the 13-inch would be a very fitting replacement for my 5-year-old MacBook. And just to delve into the future, Apple’s 15-inch MacBook Pro with Retina Display is a sleek replacement for the 17-inch MacBook Pro as an Apple status symbol, ditching the DVD drive in favour of wireless connectivity and a gorgeous screen. It is, undoubtedly, the future of Apple’s laptop line, in the same way as the MacBook Airs were when they arrived. A few years down the line, this is the path that Apple and the rest of the industry are going to follow. However, if its non-Retina 15-inch brother is out of my price range, this slice of things to come isn’t every within view. So which to go for? The 13-inch MacBook Pro seems the more professional option, with everything I might need to actually work on it and more screen real estate than my other preferred option, the 11-inch Air. Except that their screens are pretty much equal in terms of resolution, and the Air is far more convenient to carry around. Add a DVI connector to the purchase so I can use an external monitor and even that advantage slides away, leaving only speed and storage. Speed isn’t something I need to worry about much – I don’t play games on my laptop, and both machines use the same Intel graphics anyway. As for storage, I’ve been coping with a 130GB hard drive on my old laptop for years. A 256GB solid state drive would be a massive leap in terms of both capacity and speed.